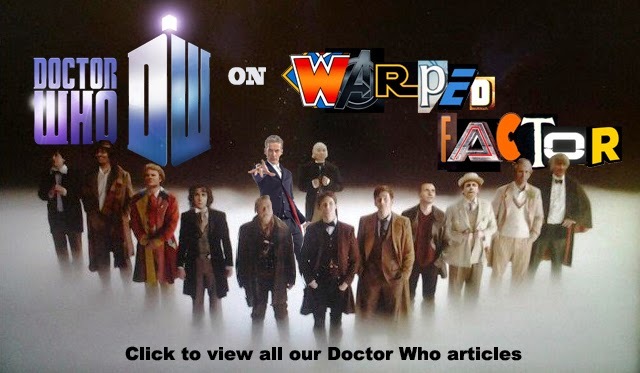 DOCTOR WHO - Companion Pieces - MEL BUSH | Warped Factor - Words in the Key of Geek. Tony Fyler goes beyond the carrot juice and the exercise bike and examines Melanie Bush, companion of the Sixth and Seventh Doctors. "I'm as truthful, honest...and about as boring as they come." As a companion's introductory self-assessment, it doesn't bode well, doesn't it? Nor, sadly, did it prove to be a cunning ruse. Melanie Bush really was pretty much as boring as they came. It didn't help with viewer-engagement that we saw her whole first adventure at one remove, with occasional tedious interjections from The Inquisitor or The Valeyard. 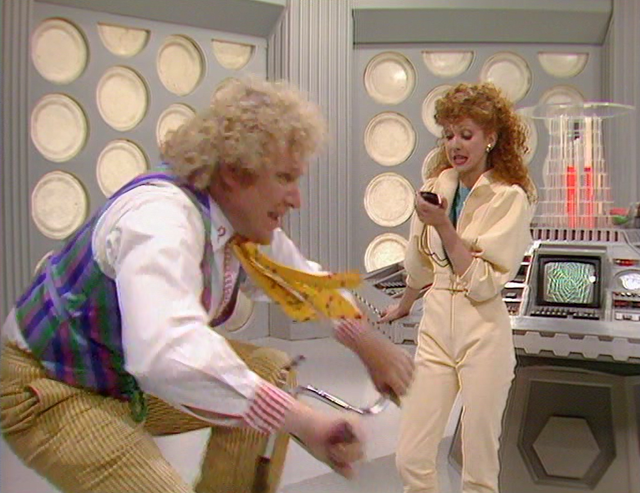 Nor did it help that we'd just said goodbye in deeply traumatic circumstances to Peri, the plucky American who had found a way to be herself even with the spiky Sixth Doctor. As a matter of comparison, Sarah-Jane sneaked on board the Tardis following her journalistic instinct. Jo pulled strings with an influential relative to get a gig with UNIT. Leela pushed her way onto the Tardis. In one of the most misjudged timey-wimey moments in the show's history, the programme followed up the trauma of Peri’s brutal death with a companion already in situ, with no hint of an origin story, just bam! Here, have another companion. She's… she’s… oh, she’s a computer programmer from Pease Pottage and oh look, she's also Bonnie Langford, have fun, people! There's a doctrine in the art of effective writing called "show, don't tell," which says that if you tell us a person’s a computer programmer, we instinctively shrug and say "prove it," whereas if you show us a person programming computers, we immediately invest our belief in their skills. Someone in the 80s Doctor Who production team needed to be slapped upside the head with a book on effective writing because we never see Mel go anywhere near a computer, except the Valeyard's "megabyte modem" - which even at the time, many viewers watched thinking "Wait...isn't a modem that box you use to connect to that...internetty thing? How is that supposed to be dangerous?" 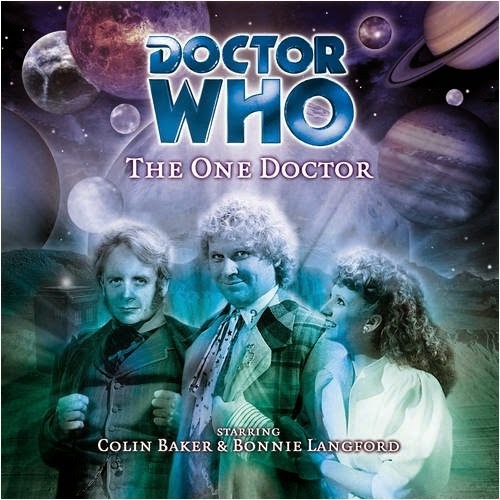 That means her one-line backstory never convinced on any level, and all we were left with was Bonnie Langford. Throughout her on-screen life, Melanie Bush seemed a peculiarly bland OmniCompanion. 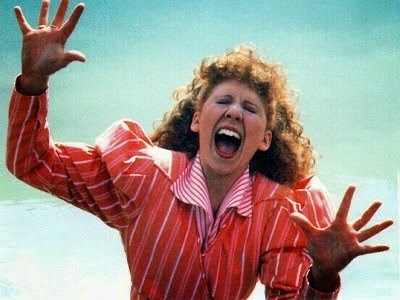 And let’s clear this up right now – that was not Bonnie Langford’s fault. 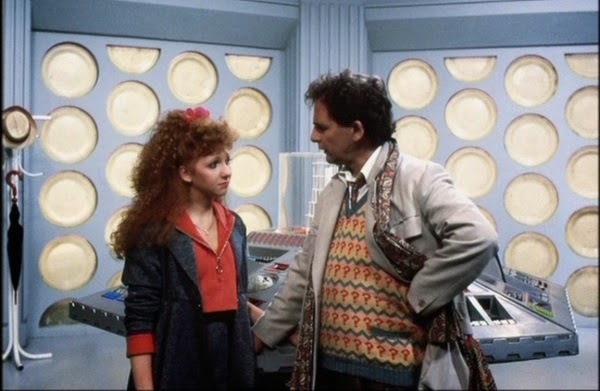 Langford was already a star before she joined the show, and you can call it an example of John Nathan-Turner’s predilection for stunt casting if you like, but the reason Mel never escaped the neon sign over her head that said “Hey look, it’s Bonnie Langford!” wasn’t Bonnie’s Langford’s fault; she threw herself into whatever she was given with an impressive degree of professional gusto. It’s more the case that ‘whatever she was given’ added up to a whole heap of not very much. The show’s writers established her character through telling, rather than showing, and then just wrote her as the skeleton of a companion, there for the screaming and the “What’s that, Doctor”ing. Compared to companions with a properly established backstory – Sarah-Jane, Jo, Leela etc – Mel never stood a chance. Melanie Bush, more than almost any other companion in the Classic era, was a companion let down by a tired writing staff. That said, if you look really, really hard, you can find elements to admire in the character. In her introductory story, Terror of the Vervoids, she displays an 80s gung-ho attitude to investigating mysteries that leads her quickly into trouble and almost into the waste disposal unit. She’s actually one of the strongest things in Time and the Rani, as, deciding she’s had enough of the short Scottish fraud claiming to be the Doctor coat, she helps engineer the impasse that gets her to the truth. She also in that story inspires Ikona to more effective rebellion, and provides a touchstone of fellow feeling for Beyus and Faroon among the many aliens on Lakertya. In Paradise Towers, Mel (despite having a somewhat monomaniacal need of a swimming pool that forces the plot into motion much against its will), shows us the core of her character in a couple of scenes – with the Cannibal Grannies, she’s a nice polite, well-brought-up middle class girl, while with Pex she is all 80s – unimpressed by pointless muscles and machismo and more impressed with solutions. And with the Kangs she embodies a key 80s message – Just Say No. She’s strong enough to resist the peer pressure of gangs and the desire to conform. She is who she is, and the Kangs can frankly go be unalive if they don’t want her to be one of them. In Dragonfire, she’s all for going on an adventure - but she’s for it in a kind of Enid Blyton, Five Go Looking For Dragons way that was already being mercilessly satirised at the time by the likes of The Comic Strip, and which contrasted sharply with the pseudo-street, kick-its-teeth-in-or-blow-it-up approach of the incoming companion, Ace. And then she’s gone – in an almost-exact inverse of the Sarah-Jane leaving scene, Mel announces she’s going to keep an eye on intergalactic cuddly con-man Sabalom Glitz, suddenly, at the end of Dragonfire, and with no foreshadowing. The Seventh Doctor, far from the stoicism of the Fourth, gives one of his best speeches, and asks her to remember him, the traveler with his days like crazy paving. Why Mel leaves seems to give more of an insight into her character than anything that has come before in her time in the Tardis – she is a nice, well-brought-up, middle class girl, looking for adventure, but also looking, like a kind of cosmic St Jude, to reform the lost causes of the universe – from her crusade to get the Sixth Doctor fit to her determination to redeem the (let’s not forget) borderline sociopathic Glitz. She hands over a Seventh Doctor she feels doesn’t need her influence any more over to Ace, the Exploding Girl, with a minimum of regret. Her job on the Tardis is done. Mel’s audio adventures in the Big Finish universe have done a lot to repair the damage of the half-hearted writing that rendered her on TV. In The One Doctor, she’s paired up with a con-man (again!) – this time pretending to be The Doctor and milking his reputation for money. With the inspired casting of Christopher Biggins as the Fake Doctor, we begin to see Mel’s strengths – her independence of thought, her stubborn refusal to give in when she thinks she’s right (she is after all, a Very 80s Companion), and of course, the ‘memory like an elephant’ – really used to their full effect. In other stories she’s given more backstory too – memorising a list of dinosaurs as a child in The Wrong Doctors, or striding through snow to put on a show for the old folks of Pease Pottage one Christmas. But if you want a real insight into the steel core of Melanie Bush, try the non-canonical Unbound story, He Jests At Scars. Quite apart from a powerhouse performance from Michael Jayston as The Valyard in a universe where he wins at the end of the Trial, it shows the lengths that Mel would go to stop him, adding a real flinty edge to the usually frothy companion, and giving Langford the chance to stretch her dramatic muscles that the TV show almost always denied her. 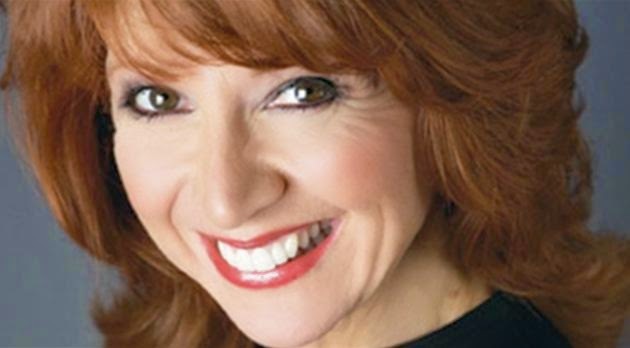 Bonnie Langford was a star before she came to Doctor Who, and she has continued to plough her unique furrow in the nation’s entertainment consciousness, though more particularly on stage than on screen in recent years. Melanie Bush is unlikely to be top of many people’s ‘Favourite Companion’ lists, but it would be a mistake ever to lay the blame for Mel’s image as a ‘typical screaming companion’ at Langford’s door. Big Finish has shown that with more diligent writing and care of her character, Mel can more than hold her own in the roll-call of companions. If there’s a lesson to current and future production teams in Mel though, it would be that if you introduce a companion entirely as a mystery and try to paste in their backstory later, you end up never entirely convincing with the deeper reality of their life when you stand them next to companions whose backstories define clearly who they are from the beginning – which might help explain why Clara, the ‘Impossible Girl’ who’s been nanny, entertainment officer, babysitter and now, a season into her time, is revealed as actually being a teacher, has taken so long to gel with sections of the audience. While it proves that there’s very little new in the world of fiction, and while Mel has been to some extent rehabilitated by her Big Finish outings, the writing strategy that led her on-screen portrayal to lack a sense of rooted reality is perhaps one that could have done without reapplication in 21st century Who.